Is It Illegal To Instagram Your Vote? This may sound familiar: a friend of yours posts a picture of her completed ballot, shot moments ago, inside a New York City voting booth. Was it legal to take that photo to begin with? In a surprising number of states, this simple act—one you've no doubt seen repeated on Instagram and Facebook dozens of times today—would've constituted a misdemeanor. Seem ridiculous? Of course it is. But for many, many people, it's the law. Here's a guide to how legal it is to Instagram your vote no matter where you live. According to the Citizen Media Law Project's Documenting the Vote 2012, the laws vary wildly from state to state. In New York—from which most of my friends' photos have been posted—the § 17-130 law is unequivocal. "Any person who...makes or keeps any memorandum of anything occurring within the booth, or directly or indirectly, reveals to another the name of any candidate voted for by such voter; or shows his ballot after it is prepared for voting, to any person so as to reveal the contents...is guilty of a misdemeanor." Ditto Florida, and the overwhelming majority of municipalities. Delaware, though? You're all good. Knock yourself out. 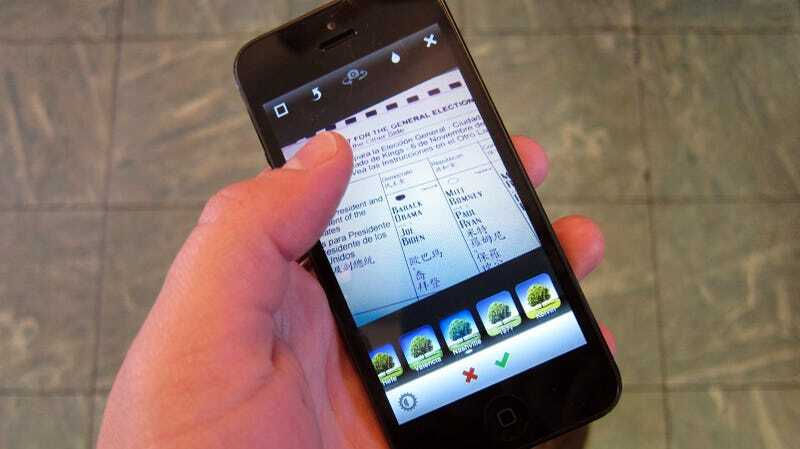 Here's a complete list of what your state laws have to say about photos in the voting booth. See the thorough resource assembled by Citizen Media Law Project for much of the same info in handy chart form. Alabama: Voters may not take photos or videos inside the polling place. Alaska: A voter may not exhibit the voter's ballot to an election official or any other person so as to enable any person to ascertain how the voter marked the ballot. Arizona: It is a class 2 misdemeanor to "show the voter's ballot or the machine on which the voter has voted to any person after it is prepared for voting in such a manner as to reveal the contents, except to an authorized person lawfully assisting the voter." Arkansas: It is illegal to "divulge to any person the results of any votes cast for any candidate or on any issue in the election until after the closing of the polls on the day of the election." California: The Elections Code states: "After the ballot is marked, a voter shall not show it to any person in such a way as to reveal its contents." Colorado: Colorado law does not permit anyone to show how they voted or to show how others voted. Some county clerks do not permit cameras, cell phones and other electronic devices inside the polling place—check with your county clerk to be sure. Connecticut: This state criminalizes "any act which invades or interferes with the secrecy of the voting or causes the same to be invaded or interfered with." But whether disclosure of one's own vote would violate the statute is not clear. Delaware: There doesn't seem to be a law on Delaware's books that could be interpreted as prohibiting an Instagrammed ballot—so, fire away! District of Columbia:The D.C. Code states that "Voting in all elections shall be secret." It seems legal to photograph your own ballot for purposes of documentation, but that sharing it with anyone would violate the Code. Florida: The state expressly prohibits photography inside a polling room. Georgia: In Georgia, "no elector shall use photographic or other electronic monitoring or recording devices or cellular telephones while such elector is within the enclosed space in a polling place." Hawaii: Kind of an odd one. You forfeit your right to vote if you "willfully exhibit a voted ballot or unvoted ballot" from a primary election—but the law doesn't clearly say whether it'd be ok to share an image of a completed ballot in a general election like today's. Idaho: It's definitely illegal for someone to "attempt to induce any voter to display his ticket," but it's unclear whether you can legally voluntarily photograph and display your own ballot, aka "ticket." Illinois:Nothing in the Illinois election code states that it's illegal to photograph or share an image of a ballot. Indiana: Indiana has a specific statute governing media access to polls, but it is unclear whether those laws apply to non-media seeking to photograph and share a ballot. Iowa: Iowa prohibits the use of cameras, cellular telephones, pagers, or other electronic communications devices in the voting booth. Kansas: Kansas calls "disclosing or exposing the contents of any ballot or the manner in which the ballot has been voted," an "unauthorized voting disclosure." Kentucky: In Kentucky, you cannot record the identity of voters within the voting room, but it is not clear that this would prohibit a voter recording his own vote. Louisiana: A video camera may be used at the polling place, provided that it does not interfere with the voting process. Maine: In 2011, Maine made it legal for a person to disclose his or her own ballot. Maryland It is unclear whether a Maryland court would consider the photography of a ballot to be a reproduction or possession of a ballot to be a violation. Massachusetts: The Secretary of State's office has stated that "observers may not use cellular phones within the polling place." Michigan: Michigan prohibits voter use of video cameras, cameras, recording equipment, and cell phones in the polls. Minnesota: The Office of the Minnesota Secretary of State strongly discourages voters from using cameras or video recorders in the polling place. And you can't share your ballot results with anyone in the polling place, but it is unclear whether you could legally share it with the rest of the internet. Mississippi: Members of the news media are allowed to record inside the polling place—it's unclear whether this could apply to citizen journalists. Missouri: Voters are prohibited from allowing a ballot to be seen by any person with the intent of letting it be known how anyone is about to vote or has voted. Montana: An elector may not show the contents of the elector's ballot to anyone after it is marked. Nebraska: The Nebraska Secretary of State requests that people turn off their cell phones and refrain from using cameras while at the polls. Nevada: Photographing or otherwise recording conduct of voting by members of general public prohibited. New Hampshire No voter shall allow his ballot to be seen by any person with the intention of letting it be known how he is about to vote—it's unclear whether it's ok to share after the vote has been cast. New Jersey: It is unclear whether citizen recording inside the polling place would fall under a ban on "expressive activity" within 100 feet of the polling place. New Mexico:New Mexico prohibits election observers from using cell phones and electronic recording equipment during a provisional ballot counting process, but no similar regulation exists for non-provisional ballots. New York: Voters are prohibited from showing their ballots after prepared for voting to any person so as to reveal the contents. North Carolina:No person shall photograph, videotape, or otherwise record the image of any voter within the voting enclosure, except with the permission of both the voter and the chief judge of the precinct. North Dakota: It's unclear whether it's legal to film at the polling place. Ohio: It's illegal to exhibit any ticket or ballot which the elector intends to cast, but it's unclear whether this law would only be applied before a ballot is cast. Oklahoma: No person shall, within the election enclosure, disclose to any other person how he voted; nor shall any person expose his ballot to any other person. Oregon: Disclosure legality is unclear in the 2011 law. Pennsylvania: A voter is prohibited from revealing a "ballot or the face of the voting machine voted by him to be seen by any person with the apparent intention of letting it be known how he is about to vote. Rhode Island: No restrictions on photography. South Carolina: The South Carolina poll managers' handbook cites a request not to use cameras in the polling place. South Dakota: Laws not clear. Texas: Texas prohibits the use of recording devices within 100 feet of a voting station, but disclosure of one's own vote is not prohibited. Utah: Utah prohibits a voter's display of his/her ballot "with an intent to reveal how he[/she] is about to vote." Vermont: Photography is not expressly prohibited. Virginia: Prohibited conduct does not include sharing or photographing a ballot. Washington: Prohibited conduct does not include sharing or photographing a ballot. West Virginia: No person may enter a voting booth with any recording or electronic device in order to record or interfere with the voting process. Wisconsin: The Wisconsin Government Accountability Board Emergency Rule bans the use of cameras by observers. Wyoming: Photography is not expressly prohibited.